This book invites readers to explore the fascinating nature of American Sign Language (ASL). It introduces sign language and communication, follows with a history of sign language in general, presents the structure of ASL. 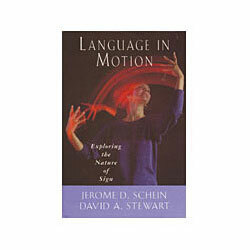 Language in Motion offers for consideration the process required to learn sign language and putting sign language to work to communicate in the Deaf community. It's perfect for those interested in learning more about sign language, Deaf culture, and Deaf communities. 240 pages.